We are a national, 501(c)(3) not-for-profit, membership organization founded in 1982. 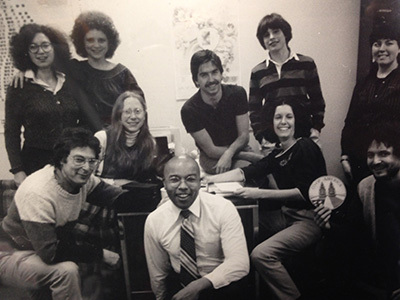 Some of Green America's staff in the 1980s. Seated, in the center with glasses, is current CEO Alisa Gravitz. In front of her, kneeling in a striped sweater, is founder and president emeritus Paul Freundlich. Directly behind Alisa is cofounder Denise Hamler. Integration of social justice and environmental values: it's what we mean when we say green. Interconnection of consumer, business, and supply chain strategies. Our democratically-elected board is elected by our members from our consumer, business, and staff stakeholders. Green America operates as a collaborative and participatory workplace, where staff members reach consensus through democratic decision-making processes on key strategic issues for the organization.